Spring time and the air is filled with the warbles of magpies, caterwauls of possums, and the pollen of wattles wafting in and out at each breath and all across the land our native flora and fauna is busy using this fertile window of warmth and daylight to catch the eye of potential mates and make the final primping touches to nests in a species-wide race to fill the next generation, furnishing their offspring with the best chances at survival. And while many have their eyes on spring time courting on the land, an artist and team of devoted researchers from Hobart have their breaths held for one particular match under the water, at a little Tasmanian fish whose mating season this spring is the culmination of years of research, trial and error in the lab and field, and of a courtship between art and science to bring this handsome fish back from the depths of near-extinction: the spotted handfish. 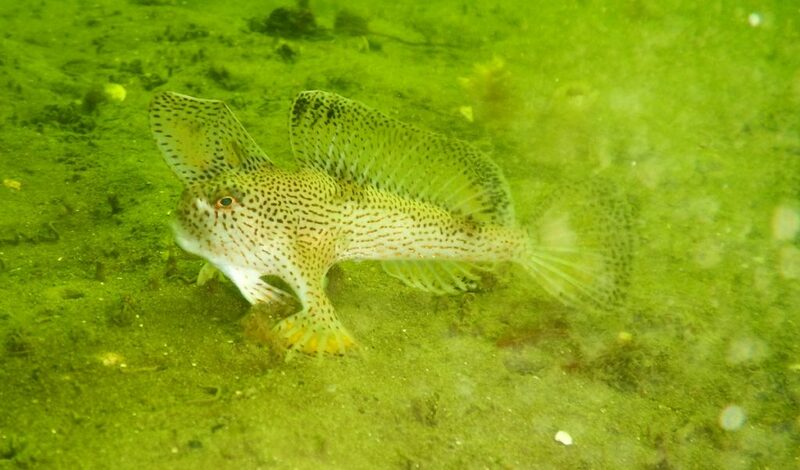 Spotted handfish (Brachionichthys hirsutus) are endemic to Tasmania and were historically widespread through estuaries and shallow bays along the east coast. 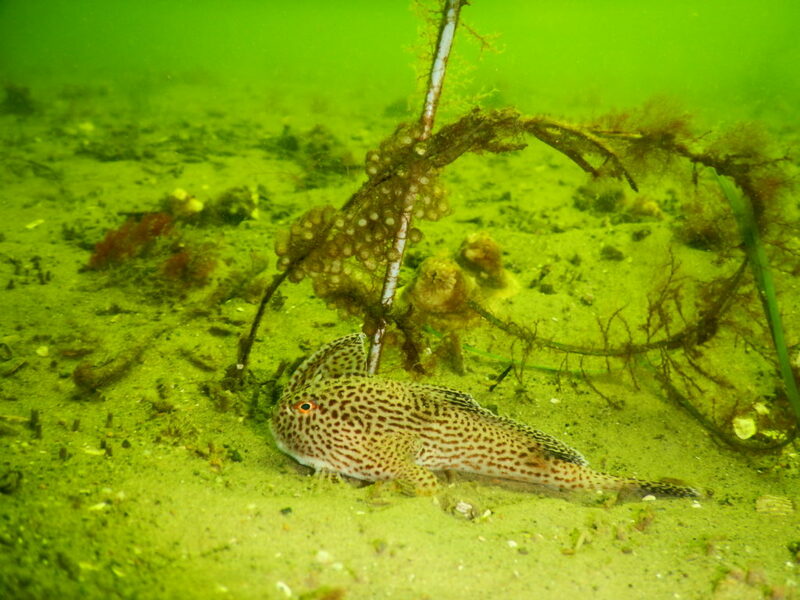 But, during the 1980s, a series of threats, slow-moving and fast, whittled populations back to the bone such that in 1996 the spotted handfish became the world’s first marine fish to be declared critically endangered—their entire species resting in the hands of just a few populations, eight, and all confined to the Derwent River. Though many factors are responsible for the decimation of handfish numbers, the fish’s stationary lifestyle and limited habitat is at the base, so let’s start there. You might be surprised to learn the spotted handfish is a type of anglerfish, complete with miniature lure and all—the most adorable, least horrific member of the order hands down. But, unlike other members of the group who use their childhoods to disperse the species far and wide through the gap-year currents of the world’s oceans, the spotted handfish spend their larval stage inside the egg, emerging into adolescence fully-formed and arms-wide open, ready to step into the shoes of their parents. Loyalty to their habitat was a great strategy. Following in the handprints of their parents and taking up the immediate real estate in the same depression of riverbed amid the silt and abandoned hermit crab whorls meant spotted handfish were born into known safety, camouflage, and a food source abundant enough to foster their own birth and presumably that of their offspring. Not only is their development supremely adapted to clinging to the same territory, but their anatomy, too. It would be strange if you hadn’t noticed either the hand-shaped fins or the ‘hand-shaped’ letters in the handfish’s name, but handfish have eschewed the traditional fishy lifestyle—swimming n’ that—for a subsistence one on the seafloor, swapping out their swim bladder (the PFD that keeps fish looking so chill) for a sweet pair of mitts to anchor themselves to the mud. It appears they’ve evolved the face for the curmudgeon lifestyle, too: lips and nose locked to an endearing pout, eyes fixed at a displeased tilt as they gaze past ribbons of seaweed spiralling about, hands like stilts in the silt sitting stalwart to weather the occasional turbulence. It’s clear these fish weren’t built for wanderlust: their developmental phase, their anatomy…their faces, but for this story perhaps the most poignant feature at the root of their dwindled populations—their fragile existence—are sea squirts. Sea what? Squirts. Sea squirts, or ascidians, are primitive filter feeding animals that resemble barrels or jugs having found life in the depths. A Tasmanian species, the stalked ascidian, resembles a banksia seed cone on a stem and was once widespread through estuaries along Tasmania’s coast, the creatures strong in their stalked base buried in the riverbeds, providing an anchor against the currents, but vulnerable in their immobility to (slow-moving) predators like starfish. But let’s spring back to the spotted handfish for a moment. Eggs are, arguably, the most vulnerable stage of an animal’s life—the bottle-neck for a species, the tenuous connection between generations—and for the spotted handfish this is no different. During September and early spring, handfish mammas need to lay a mass of eggs and guard them for six to eight weeks before hatching, but given the currents of their habitat they require a stable stalk, one anchored to the bed, to adhere the gelatinous clutch to. 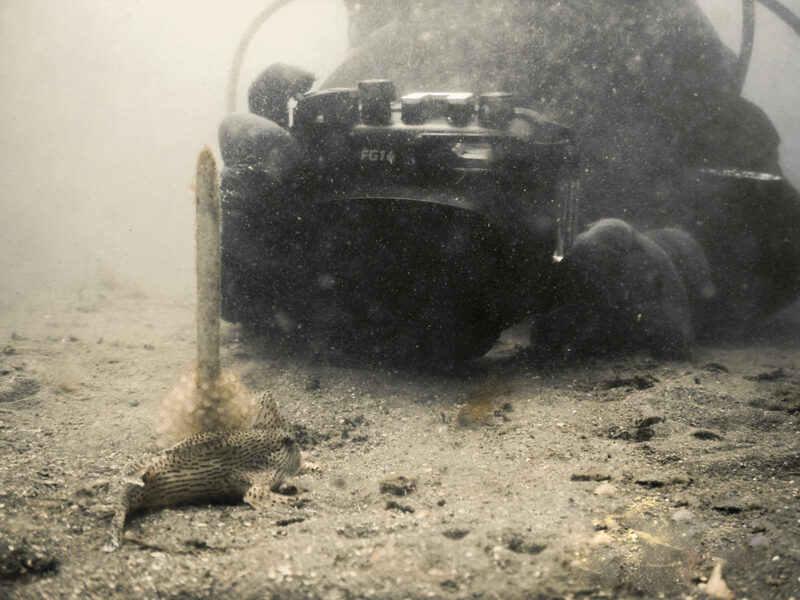 Pre-1980s, when spotted handfish were abundant this home sweet home was, of course, the stalked ascidian, but then a new and invasive predator came to town: the Pacific seastar. 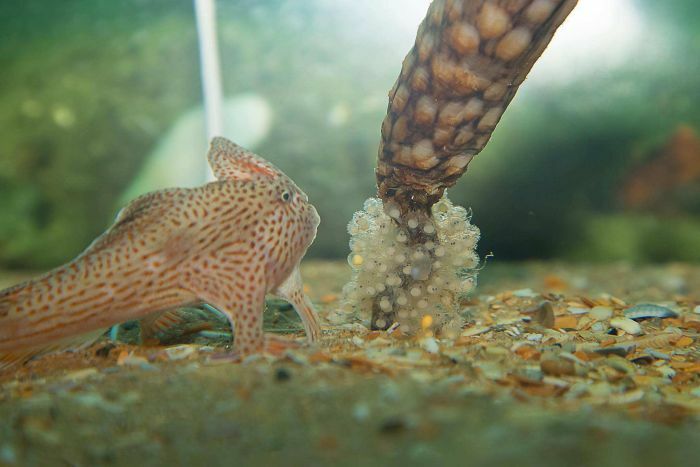 And so it was, when the five-legged carnivore crept through Tasmanian waters preying on the ascidian—inter-generational handfish tether—numbers crashed, both of the sea squirts and of the spotted handfish. Since then, there have been stand-up efforts from the scientific community: our researchers, SEA LIFE Melbourne Aquarium, Derwent Estuary Program, and more, joining hands to form the Handfish Recovery Team. The team has been researching and breeding the spotted handfish, even cultivating a ‘back-up’ insurance population in captivity—should worse come to worse. This year marks the team’s most promising project yet: to restore numbers of fish not just in captivity but in the wild. The successful breeding of handfish isn’t just about individuals mating, of course, but of their eggs taking hold and being seen through to maturity, and with no stalked ascidians or natural analogue, this was an issue to be solved. Hands together then when Venn diagram centrepiece Jane Bamford—Hobartian, snorkeler, compassionate Coastcare member, and ceramic artist—heard of the handfish’s plight and joined up with the Handfish Recovery Team to lend a hand sculpting a solution. Working with the team, Jane used her ceramicist skills to create an alternative structure for handfish mammas to attach their eggs to. Modelled on the stalked ascidian, the structures are in two parts: an extruded stem and a base, both from inert ceramic. A time-consuming process, Jane blazed ahead for two years, firing and glazing over 3,000 of these pseudo-stalked ascidians in preparation for deployment. All through winter this year, the ‘night before spring’, the team were busy preparing for handfish spring time mating season like submarine birds and bees, diving the Derwent—the last vestige of handfish and habitat for mating pairs—the two-piece sculpted ascidians planted for the to-be couples like ceramic arrows in the target bases buried in the rump of the riverbed. And then they waited with bated breath. Finally, September, spring time—the magpies, the possums, the wattle pollen—and a thankful exhale: the handfish mothers took to the ceramics! The artificial ascidians were a success—the porcelain stalks wrapped in a tunic of eggs and guarded by that endearing, pouting face of a loyal mother. With just 2,000 individual fish remaining, a mere handful from historic populations, the success of these artificial homes, the success of a marriage between art and science, proffers high hopes for the future of our delightful pouting homebody, our spotted handfish. We've proffered a helping hand to handfish for twenty years. Here's the history. Well done everyone including Seahorse world at Beauty Point Tasmania for helping to save this Species. Hopefully one day soon we will see this little fush back through all the Tasmanian waters. This is fabulous news. Diverse collaborative efforts have proved fruitful and let’s hope these fish can be once again seen around the eastern seaboard as well as Hobart.